The few paragraphs below were written and posted here in January 2008 and they still correctly describe my thoughts. Yet much has happened since! A log of developments is in the sections further down. For the current state of affairs, see http://disavowal.ca. I affirm that I will be faithful and bear true allegiance to Her Majesty Queen Elizabeth II, Queen of Canada, Her Heirs and Successors, and that I will faithfully observe the laws of Canada and fulfil my duties as a Canadian citizen. The laws are fine; I'm ready to observe them and to fulfill my duties as a Canadian citizen. But allegiance to the Queen? This or any, or a king, or their heirs? No, that's not for me. Royalty represents that some people may be born with a state-sanctioned privilege. This is hard for me to stomach. (And if royalty is a stain, a state-sanctioned stain is harder to stomach). I can imagine a future time when dire needs, or merely the wish to better take part in the civil life of the country I live in, will lead me to change my position, tell a little white lie, and take the oath. But probably not for a while, and possibly never. Just to be clear, I regret this greatly. I would much rather be a Canadian citizen. 29 Added September 21, 2013 - Updated "Opinion Document"
33 Added July 12, 2013 - Hearing! 43 Added September 16, 2012 - Lawsuit! Further documents and links are in Pensieve: Projects: Citizenship. I currently owe the cause $142.72 (see November 11, 2017). Just spent $107.12 on web hosting for disavowal.ca. My debt to the cause goes down from the $249.84 of November 11, 2015 to $142.72. I was briefly interviewed at the Spadina Literary Review. The source files: SpadinaLiteraryReviewInterview.docx, SpadinaLiteraryReviewInterview.pdf. Oath taken and partially disavowed, back on November 30, 2015. More at disavowal.ca. I finalized my "pre-oath letter" to the presiding citizenship judge and went to Citizenship and Immigration Canada Scarborough Office to find the name of said judge and her/his mailing address. To my surprise and delight, they were nice and accommodating; I ended up talking to John Lu, the manager of said office, who gave me the information I was seeking. He also requested that I agree to take the oath a few days later, so that the venue would be their office rather than the original venue which was off-site. I agreed and so my new oath date and time is Monday November 30 at 10:30AM, and the Scarborough CIC at 200 Town Centre Court, Suite 370, Scarborough. We agreed that at the "taking pictures with the judge" phase of the ceremony, which is after the oath itself, I will be able to present a "disavowal letter" to the judge. I hope to post pictures here on or soon after November 30! Just spent $129.66 on web hosting for a future web site (not yet active). My debt to the cause goes down from the $379.50 of March 4 to $249.84. "... the appellants have the opportunity to publicly disavow what they consider to be the message conveyed by the oath. ..."
Nothing new so far, so I called CIC at 1-888-242-2100 to ask for news. "Call again after October 8", they said. As I have indicated in my affidavit, paragraph 19, I am now unfreezing my citizenship process. $11.40 for registered mail to Citizenship and Immigration Canada, meaning that I owe the cause $114.00 in addition to the $265.50 of March 24, 2014, to a total of $379.50. Our application to the Supreme Court of Canada for a leave to appeal was dismissed. This may or may not be the end of the story - I am studying my further options. Our response to the document right below. The Attorney General filed their response to our "leave to appeal" at the Supreme Court of Canada. We filed our "leave to appeal" at the Supreme Court of Canada today! In English: we request that our appeal will be heard, and the Supreme Court may or may not grant our request. The Attorney General now has 30 days to respond, then we will have another 10 days to respond to them, and sometime later, probably in early 2015, the Supreme Court will announce whether or not they will hear the appeal. Documents: LeaveToAppeal.pdf and references, LeaveToAppealAuthorities1.pdf and LeaveToAppealAuthorities2.pdf. Also, I forgot to write that already in August attorney Nicolas Martin Rouleau joined our case. In fact, he did the major part of the work on the "leave to appeal". An hour-long radio program on the subject in CBC Radio One is here. There's a short clip from an older interview with me early on, and many phone calls, and a lot by Peter Rosenthal. We lost the appeal (already a few days ago, but I was canoeing with no access to phone/internet, so I only heard about it late yesterday). The judges' decision is here. We will ask for a leave to be heard by the Supreme Court of Canada. I was informed today that my citizenship ceremony had been postponed "pending litigation". Yey! I got invited to take the oath on May 20! I won't, of course. I don't know yet if this will kill my citizenship application and I will have to restart, or if Citizenship and Immigration Canada will agree to postpone the oath for as long as the the case is in the courts. We will ask, of course. 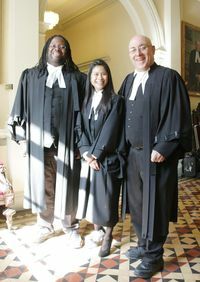 Our legal team: Selwyn Pieters, Reni Chang, and Peter Rosenthal (not in pictures: Michael Smith). Also, my interview on CTV yesterday is here. Our appeal was heard today! Needless to say, I thought our side was the more convincing... But more seriously, it very hard to tell what the judges thought, and there isn't much to do other than to wait a few weeks or months until they reach their decision. My radio interview with Jim Richards of the Jim Richards Showgram is at InterviewWithJimRichards-140407.mp3. Our appeal will be heard at the federal court of appeal for Ontario on Tuesday April 8, 2014, at 10:30AM in a courtroom at Osgoode Hall, 130 Queen St. W., Toronto. See OathAppealPressRelease.pdf. I passed the citizenship test and the oath is now just 1-2 months away. They said they wouldn't allow me to postpone the oath, so possibly even that will have to go through the courts. Anyway, $5.40 was spent on public transportation to the offices of Citizenship and Immigration Canada, meaning that I owe the cause $54.00 in addition to the $211.50 of Feb 12, 2014, to a total of $265.50. I got re-re-invited to take the citizenship test. This time the date is good: March 24, 2014. My first test to take (rather than write) in about 8 years! The previous was when I needed to get a "Powered Vessel Operator's Permit" to operate the backup motor of a sailboat within the Toronto Harbour. I got re-invited for the citizenship test. Again unfortunately, the scheduled date is February 21, and on that date I will be in a conference in Vienna. So today I had to send a letter by registered mail asking for a new new date. $10.85 for the postage means that I owe the cause $108.50 in addition to the $103.00 of Dec 16, 2013, to a total of $211.50. I just learned that the Court of Appeal for Ontario will be hearing our appeal on April 8, 2014. Also, some new documents posted: Oath_Case_Respondents_factum_090114@.pdf (annotated), Oath_Case_Respondents_factum_090114.pdf (raw), and OathAppellantsFactumAsRespondentsToTheCrossAppeal.pdf. I got invited for the citizenship test. Unfortunately I was out of the country for the whole interval between the date the invitation was sent (November 21) and the date of the test (December 9), so I missed the test and today I had to send a letter by registered mail asking for a new date. $10.30 for the postage means that I owe the cause $103.00. Our appeal factum is now online. Added September 21, 2013 - Updated "Opinion Document"
I've updated my "opinion document" at http://drorbn.net/Canada/Response to include a preliminary comment on Judge Morgan's decision. We lost the first round, yet Judge Morgan agrees that freedom of speech is infringed by the oath (see Judge Morgan's decision). I disagree with much (but not all) of the decision, though it will take me/us some time to write a reasoned response. I've added my "opinion document" at http://drorbn.net/Canada/Response. I had a live-TV interview with Brian Dunstan of Sun News. Here it is, on their page and as my own low-quality rip. (I hope to eventually get the sources from them and put a decent quality version here). Added July 12, 2013 - Hearing! We had our court day today! I think it went very well, but the judge makes the decision and we have to see what he thinks. The decision is expected in 1-4 months. The courtroom for tomorrow (Friday July 12, 10AM) will be Courtroom 708, 393 University Ave., Toronto Courtroom 5 - 0 at 330 University Ave (West side of University just north of Queen St.). Also, as of today this page is reverse-chronological rather than chronological, and I have re-ordered the "Quick Links" section. The Citizenship Act requires applicants for citizenship to swear or affirm that they will bear true allegiance to Queen Elizabeth the Second and her Heirs and Successors. Many people who feel that the monarchy is an anti-democratic relic of the past conscientiously object to taking such an oath and feel that it should suffice to take an oath to Canada. Twenty years ago, the late civil rights lawyer Charles Roach launched a Charter challenge to this oath in the Federal Court; he lost. In 2005, Mr. Roach started a similar case in Ontario's Superior Court. The Attorney General of Canada argued that this case should not be heard because of the earlier dismissal by the Federal Court. However, it was ruled that, as a result of changes in Charter jurisprudence in the past twenty years, the case could go ahead. Mr. Roach died on October 2, 2012. The case is now proceeding on behalf of three new applicants: Michael McAteer (retired former journalist for the Toronto Star), Simone Topey (of the Black Action Defence Committee) and Dror Bar-Natan (Professor of Mathematics at the University of Toronto). For reasons of conscience and/or religion, the applicants feel that they cannot take the oath. 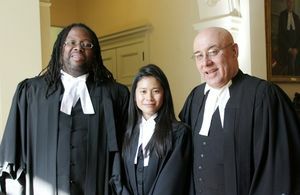 They are arguing that the oath requirement violates their rights to freedom of religion and conscience pursuant to section 2(a) of the Charter, their right to freedom of expression provided by section 2(b) of the Charter, and their equality rights guaranteed by section 15(1) of the Charter. The Attorney General of Canada is arguing that "The inability to enjoy the benefits of citizenship - to hold a Canadian passport and to vote - are amongst the costs reasonably borne by individuals whose personal beliefs run counter to Canada's foundational heritage." Peter Rosenthal, one of the lawyers representing the applicants, said: "Like the present applicants, Charles Roach really wanted to become a citizen of Canada but his conscience would not allow him to take an oath to a person that symbolized inequality. I hope that that this case will vindicate Mr. Roach's extraordinary efforts to promote equal dignity of all human beings." For more information, contact any of the applicants or Peter Rosenthal: Michael McAteer, mrpmcateer@bell.net; Simone Topey, racquiah@hotmail.com; Dror Bar-Natan, drorbn@math.toronto.edu; Peter Rosenthal, rosent@math.toronto.edu. Posted APPLICANTS'_FACTUM.pdf (2-3 weeks ago) and AttorneyGeneralFactum.pdf (today). I got an envelope from Citizenship and Immigration Canada, confirming that they are processing my application for citizenship. I got confirmation from Peter Rosenthal that I was formally added as an applicant to the application (lawsuit) (ChangingApplicants-121121.pdf), and that the application itself was slightly revised, mostly to reflect the name changes. The revised application is AmendedApplication-121121.pdf. I've added a "Quick Links" section near the top of this page. AFFIDAVIT_OF_MICHAEL_MCATEER.pdf - the first-named applicant. Topey_Affidavit.pdf - the second-named applicant. AFFIDAVIT_OF_ASHOK_CHARLES.pdf, who signed the oath under duress. AFFIDAVIT_OF_HOWARD_JEROME_GOMBERG.pdf, who signed the oath under duress. AFFIDAVIT_OF_RANDALL_WHITE.pdf - an expert witness. Sad news: I have just learned from Peter Rosenthal that the "first applicant" in our lawsuit against the government of Canada, Charlie Roach, passed away a few days ago. The lawsuit moves on, of course. Good news: I have also learned from Peter that the date for the hearing of the suit has been set to be July 12, 2013. I have just sent my application for a Canadian citizenship (the oath itself is still about a year away, assuming reasonable processing times). The fee for the application was $200 and the postage $14.58. I have therefore put aside an amount of $2,145.80 to be spent on the above lawsuit, at the discretion of the lawyer pursuing it, Peter Rosenthal. Added September 16, 2012 - Lawsuit! 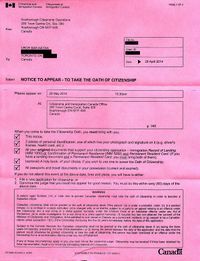 Roach_Canada_Fresh_application_100912.pdf - the notice of application to the Ontario Superior Court of Justice, as filed on June 18, 2012. BAR-NATAN_Affidavit.pdf - my own affidavit on that matter. On August 7, 2012 I paid $15.81 for two passport photos of myself and donated $158.10 to Citizens for a Canadian Republic. Those photos look just like passport photos; evidence on the right. For any $ amount I will be spending on becoming Canadian (fees, photographs, photocopies, stamps, anything) I will donate 10 times as much to Citizens for a Canadian Republic or a similar organization. If the expense will force a delay in the proceedings, the proceedings will be delayed. A summary of these expenses and donations will be posted here. On the day that I will take my citizenship oath (if it will not be changed by then), I will write a personal yet public letter to the Canadian monarch acknowledging being bound by the oath yet asking her/him to release me from the "allegiance to a monarch" part of that oath, and explaining my reasons for wishing not to be bound by an oath to a monarch. This page was last modified on 11 November 2017, at 07:35. This page has been accessed 149,601 times.